This two-mile forested Environs Trail loop (part of the larger Deer Creek Tribute Trail system) follows the old Rough and Ready ditch and remnants of the Providence Mine. Interpretive signs along the trail tell of the history, language and culture of the native Nisenan Tribe of the Nevada City Rancheria. The route weaves through tall stands of incense cedars, black oaks and Douglas fir trees, providing access to a 40-acre forest owned by Nevada City for more than 30 years. 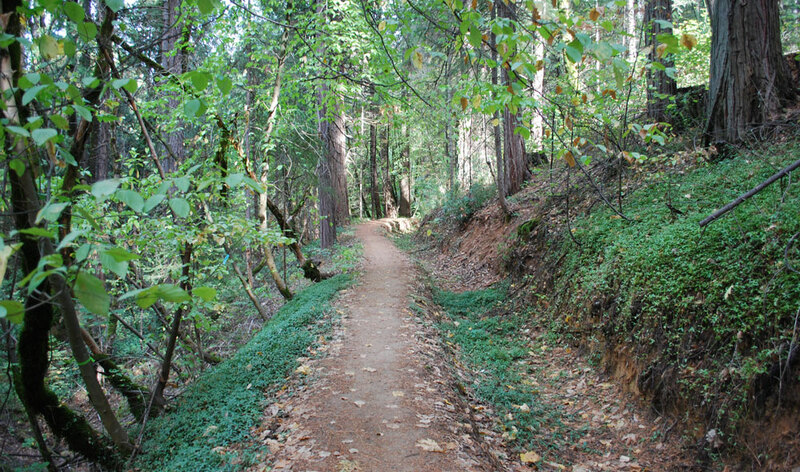 Hikers and bikers can glimpse traces of Nevada City’s Gold Rush history. The Providence Mine and the Champion Mine were the two largest producing gold mines of the Nevada City mining district. The trail follows the Rough & Ready Ditch, built in 1850. Sixteen miles long, the ditch brought water from Deer Creek about five miles east of Nevada City to the mining area of Rough & Ready.